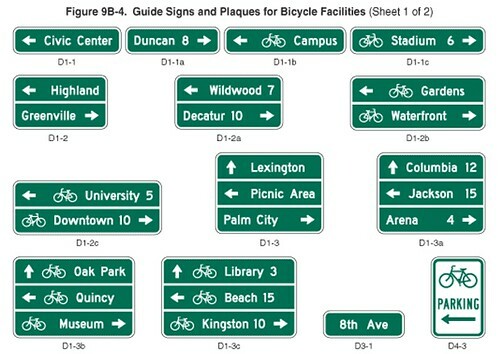 According to FHWA, bike route wayfinding can be implemented today if the signs used are compliant with the Federal Manual on Uniform Traffic Control Devices (MUTCD) – the Final Draft 2011 CA MUTCD (Section 9B) also includes bicycle guide signage. Non-compliant signs will be deemed experimental and require applications for experimentation. The City of Los Angeles will be using approved MUTCD signage identical to the image below for our wayfinding signage. Using standardized signage is advantageous because the signs will be more readily identifiable by bicyclists throughout the City. LADOT plans on prioritizing wayfinding signage implementation along Bicycle Friendly Street (BFS) facilities in the five year implementation plan and along other appropriate facilities like the L.A. River bike path and the Orange Line bike path. We will be conducting neighborhood outreach to garner input from local communities to determine appropriate destinations for display. 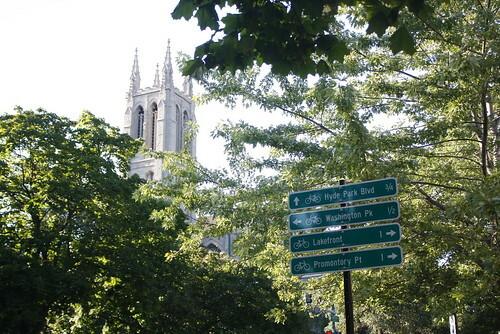 We’d like to know what kind of destinations you’d like to see on these signs. Metro Rail stops, transit centers, and other bikeways are already a given. Should we follow Oakland’s guidelines and develop our own destination hierarchy? Should we include parks, elementary and middle schools, police and fire stations, etc? Share your thoughts in the comments section below. Brilliant!!!!! I like the signs; they tell me direction, miles and the area or destination. I hope LADOT puts them up everywhere! I have ridden in Long Beach and I don’t like the signs with just numbers on them 1, 17, 23, etc….it doesn’t tell anything except I’m on some bike street. Let’s see; parks, beaches, local attractions, large streets, universities (USC, UCLA, etc,), local communities, local schools, transit…….the list is endless. For the LA River and Arroyo Seco trails there should be signage at every exit indicating the nearest large intersection. It would also be helpful to have “next exit x miles” like on a freeway for long sections without exits (especially on the Arroyo Seco path). It would also be advisable to have signs pointing to the river paths on nearby streets for every entrance to the paths. This will make these paths much more useful as transportation routes. 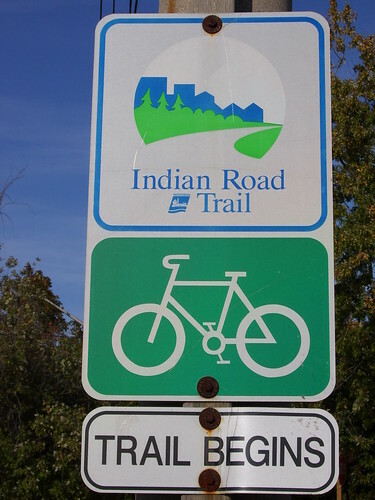 These signs are intended to provide guidance for bicyclists who don’t know where they are going. For that reason, I don’t see a need to include elementary schools or middle schools. I assume that virtually all people bicycling to these schools are students, faculty or staff. They don’t need signage to get to a destination they’ve been to hundreds of times. In any event, there are so many elementary and middle schools that we would end up with a confusing (and visually intrusive) profusion of signs. An important issue to consider is how you deal with private attractions, such as shopping centers. These should be given signage; in my neighborhood, the Grove/Farmers Market and Beverly Center are significant bicycle destinations. But how do you decide whether to include the Beverly Center but not the adjacent Beverly Connection? Include any major destination including larger malls, well-know restaurant rows such as Third St. between Crescent Heights and La Cienega, “urban village” areas such as Larchmont Village, public destination areas such as Hollywood & Highland and Sunset Junction, and, yes, schools–lots of kids and parents assume you can’t bicycle to school these days. And riverside bikeways, especially the new section of LA River bikeway, should name every street that has a gate to the bikeway. Areas where bikeways make non-intuitive changes should be signed with an arrow showing which way to go–eg Heliotrope at Rosewood, where the bike route (sharrowed) turns onto/off of Rosewood; one’s tendency is to go straight down Heliotrope or down Rosewood, and the sharrows aren’t immediately visible, especially if there’s traffic. Likewise the Orange Line bike path where it crosses (I think) diagonally through Burbank & Fulton. 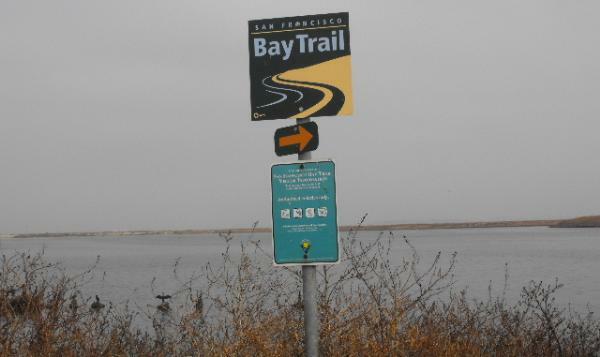 I also suggest that perhaps private destinations could be approached to purchase mention on bikeway signs, thus helping to pay for the program that will send them more customers. agreed with Maxutility above – along class 1 bike paths, it would be great to have “next exit” distances marked. when you enter the 110 bike path, you may not know that it’s 2 miles to the other end. likewise, the bike path along the 5 has no exits between Los Feliz Blvd and the 134, also roughly 2 miles. hopefully there will be some kind of open-to-the-community meeting about placement/etc. I agree regional, tourism and recreational wayfinding signage are very important for the City of Los Angeles. It’s easy to dismiss children at local schools, but the wayfinding bike signs will help with safety by increasing awareness for drivers to watch for bicyclists. And it will build community confidence in the system. I would hope by having bike wayfinding signage and bike maps, it will help encourage more parents to allow their children to ride their bikes to school, pools, parks, and libraries. Plus promote health and a livable community. It vital we educate and promote more local bicycle trips for children. As a new generation of a young parent…. we bring our son everywhere on my bike and when he is old enough he will ride his bike to school. My father’s generation of throw the kid in the back seat of your car and drop them off is school is going by the wayside. If you have ever been to Europe you can see children on bikes everywhere…the USA needs to follow that model. Speaking of Heliotrope and Rosewood, there needs to be some better traffic control there. I lived directly above that corner until a few months ago, and literally every day that I was working from home, there would be one or two incidents where brakes squeal and someone honks because they don’t understand that only one direction has a stop sign. Fortunately I never had to go around that corner on my bike, because I always ended there instead of continuing through. I don’t know if Santa Clarita has wayfaring signs now or not, but the last time I rode down there on the bike paths a few years back, I got lost trying to find the Metrolink station and ended up riding several extra miles. So, I think signs for transit stations are important as well as signs at each underpass telling you which street you are riding under. 2) distinguish type of information required connections multimodal vs destination route based destinations, places of civic interest, land marks. 3) I feel that the information depends on the route and there is no single way to do this. I feel that the schools along a specific route can be called out as every year there are new students and if it relevant to the route then it makes sense. 5. the point someone made about commercial districts is very important. To me the idea is more like the “neighborhood loop” concept or the Lower Merion Township Bala Cynwyd trail, in how it will link a variety of civic assets and activity centers. Very interesting article! 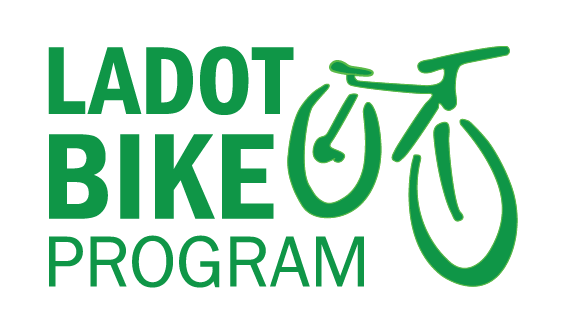 It’s great to arise people attention about our urban environment, both bicyclists and motorists, and it makes our street safer. It’s a smart approach which understand the way people interact at locations in order to develop directional strategies that encompass commercial, environmental, and aesthetic objectives. wayfinding is very interesting article! It’s great to arise people attention about our urban environment, both bicyclists and motorists, and it makes our street safer. It’s a smart approach which understand the way people interact at locations in order to develop directional strategies that encompass commercial, environmental, and aesthetic objectives. My name is John Gomez (626-622-0819) with Flint Trading. We are the manufacturer of the green preformed thermoplastic that is on 1st st in Boyle Heights. We have maintained an open contract with the City of L.A. since 1995. Safety signage has always included surface signage. Please explore the attached link to our DecoMark product line. We have the ability to create just about any communication. Thanks for the suggestion John and thanks for reading.